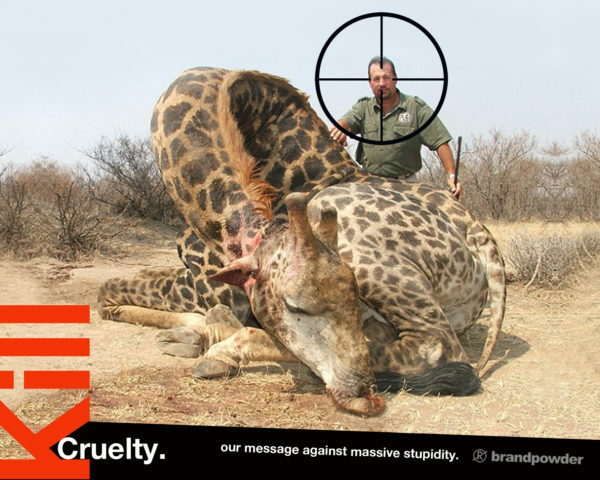 HOW CAN YOU POSSIBLY KILL A GIRAFFE? 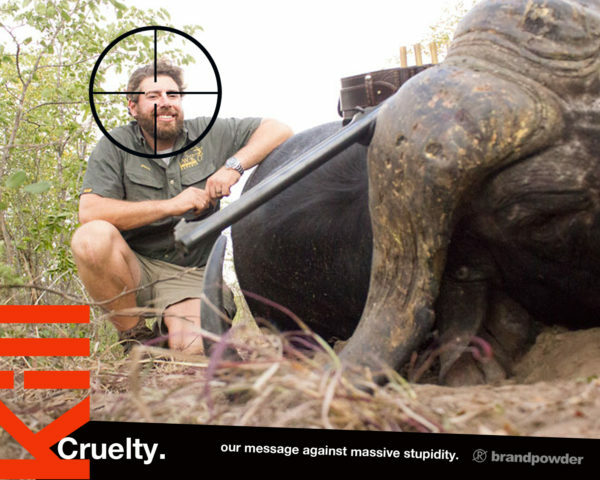 LET’S KILL CRUELTY and execute massive stupidity! This is our call. Is the message too aggressive? 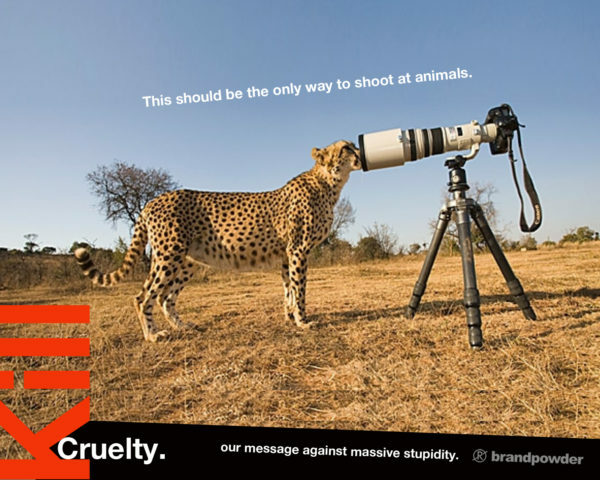 Is it going to annoy the people who take pleasure in shooting at wild animals? Isn’t it politically correct? Frankly, we don’t care. 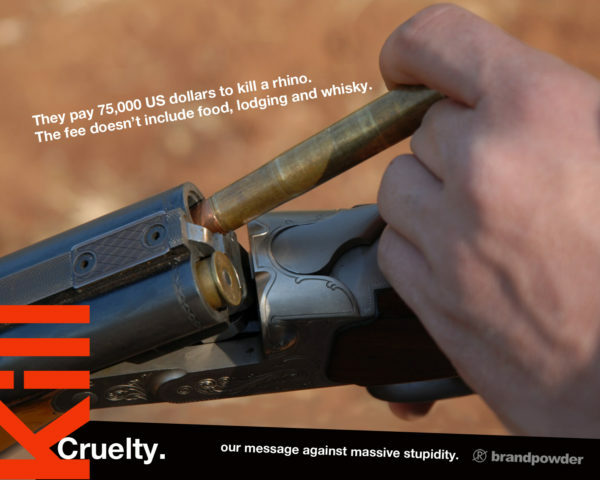 Brandpowder’s view on this issue points straight through the rifle’s scope. Communication focuses on target, right? 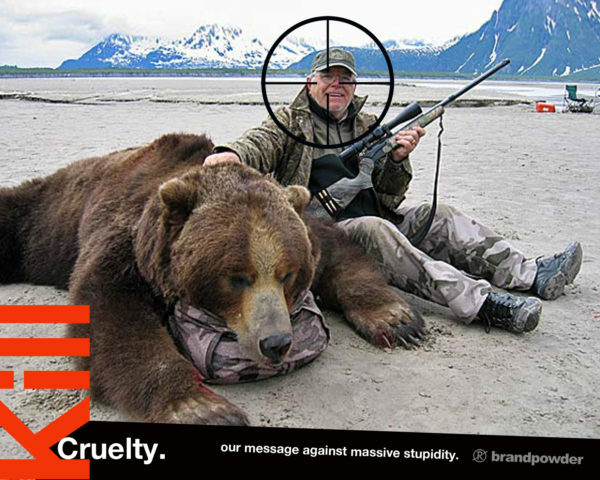 Well, we think it’s about time to consider these so-called-hunters a legal target. 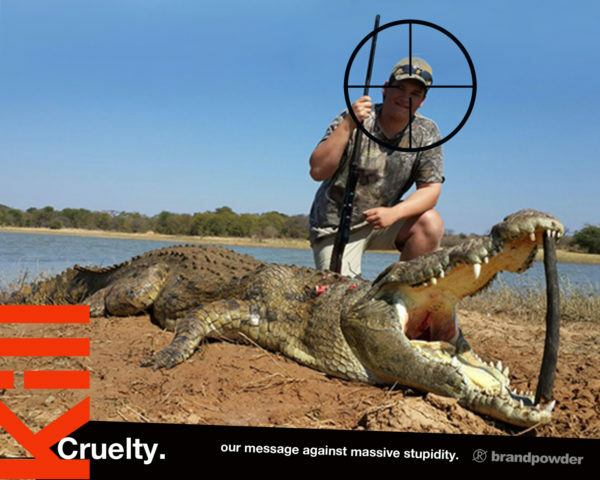 It’s a provocation, of course, but our message is addressed to them, the so-called-hunters, not to those who love animals to bits and would never think to knock them off just to hang a trophy on the wall. 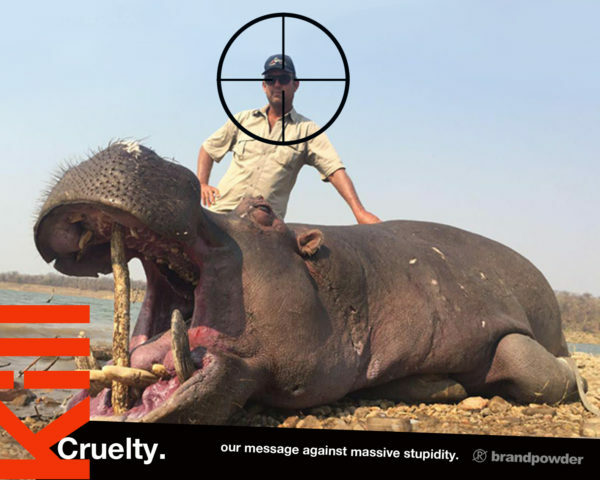 We have seen, throughout the years, several campaigns invoking a stop to the massacre of elephants, tigers, rhinos, bears, penguins and eagles. But these messages were always addressed to the general public. 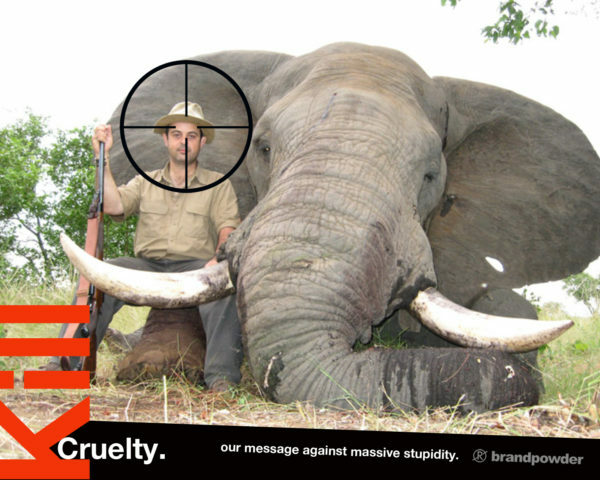 Our campaign talks to the so-called-hunters, inviting them to reverse their point of view and wear the prey’s clothes. The so-called-hunters roam the Game Reserve on 4×4 vehicles and shoot big game from a safety distance with powerful weapons. How powerful? Well, the H&H .375 cartridge, aka the African Queen is a big shot. It generates 4,500 pound of energy. 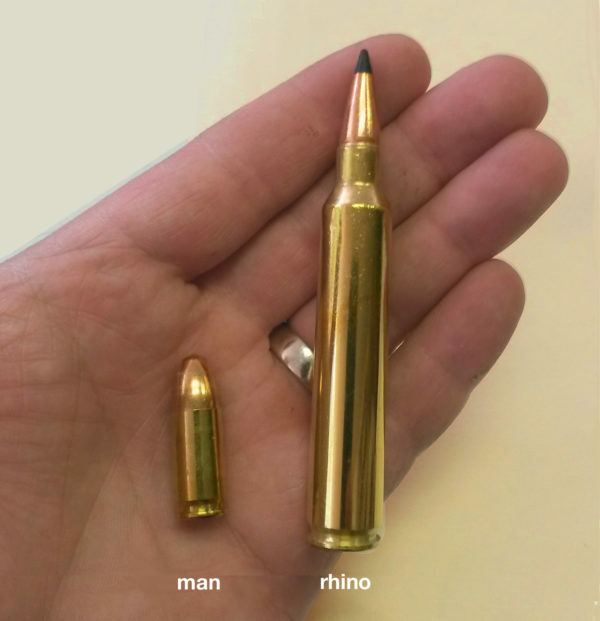 There’s no animal this bullet can’t kill, from rhino to elephant. The projectile, carefully designed to maintain a clean trajectory, travels at 800 mts per second. It hits plenty hard, penetrating the animal flesh like butter, but without damaging the hide too much, in case the so-called-hunter wants to bring it home as a souvenir. The blast of a H&H round shoots relatively flat and, most importantly, doesn’t rearrange the bones of the so-called-hunter’s shoulder at every shot. It is advertised as a safe and comfortable ammunition, and a best seller among so-called-hunters with a nostalgia for exotic Big Game Safari of the past. Thanks, Hemingway! Nevertheless, we are aware of the fact also our campaign is worth less than nothing and it will pass unnoticed. Behind hunting there’s a 800 million dollar business, attracting each year more than 15,000 so-called-hunters in sub-Saharan Africa only. 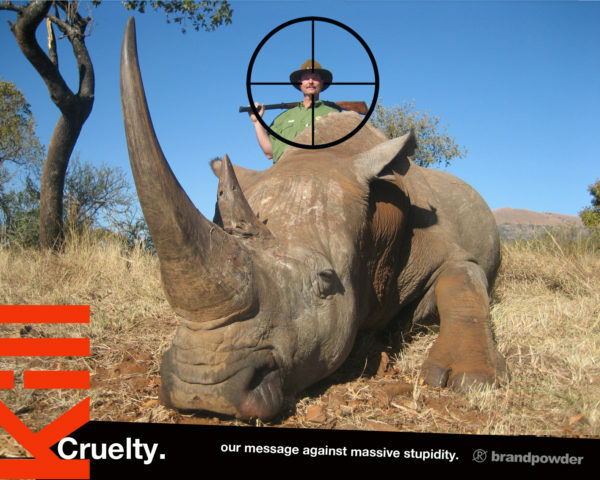 Even if representing only a small fraction of the total tourists visiting the black continent, the so-called-hunter spends 20 times more than an average visitor to indulge in this gruesome past-time. Let’s say you want to kill a giraffe, or a wildebeest, you can have a regular permit for less than 2,000 dollars. A hippo will cost you 8,000, a lion 15,000, and a crocodile above 15 ft. for about the same price. Rhinos? Well, for those horned bastards you’ll have to fork out 75,000 dollars. 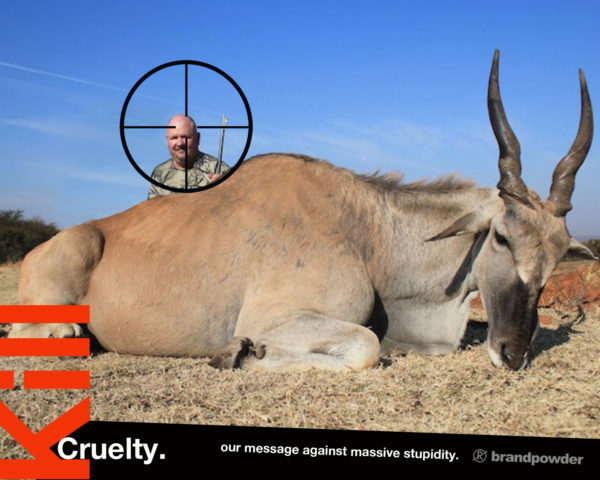 Big Game hunting is cleverly built on a marketing pyramid where zebras or springbok are affordable trophies, while to the very rich is reserved the honor to kill the rarest or the biggest animal. More money you have, more damage you make. We are sure this practice will end one day. 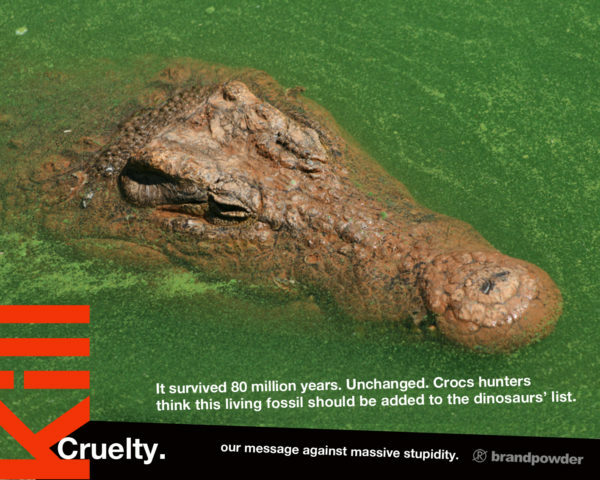 Either for the end of humanity, or the extinction of these beautiful animals. Disclaimer: Pictures in this article were taken from the internet and considered copyright-free. They were used as a source of inspiration for this essay only. No direct harm or offense is intended toward the people portrayed in these shots, who are to be considered a symbolic representation of the issue. Owners or subjects of such pictures can contact us for immediate removal from the website. No commercial income or gain is coming from any of the Brandpowder’s material published on the website. (K.L. 2016/dp).